Capitalizing on all the Breaking Bad press that led to the show doubling its audience for Sunday’s premiere, Discovery Channel’s MythBusters got Aaron Paul and Vince Gilligan on the show for a Breaking Bad special to investigate the plausibility of Walt’s fulminated mercury stunt and the bathtub/hydrofluoric acid incident from the first season. The entire episode is available on YouTube, so you can watch Jamie and Adam (and the B-team) test out the scenes, and then ultimately say screw it and just blow some stuff up because that’s what the people want. 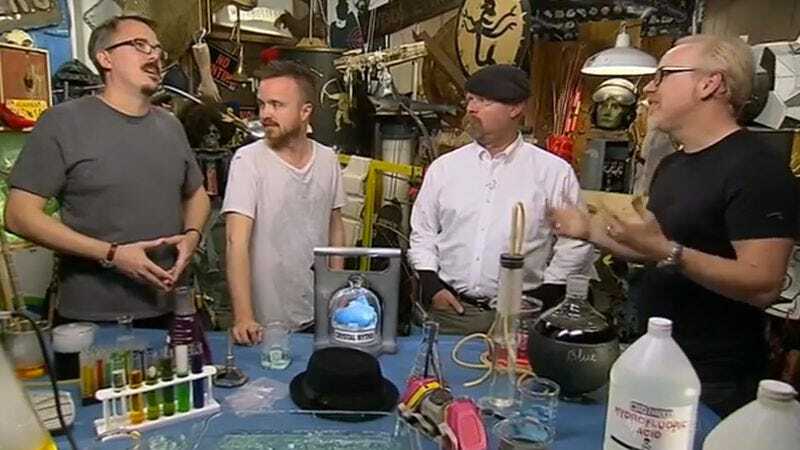 This is a family show, so it cuts out some of the gory details in the clips from the show—though they do dissolve pig flesh as a substitute for organic human matter—and there are none of Jesse's vulgar exclamations, but it's still good fun.